Lots of people on their high horse today over the Derek Jeter HBP that wasn't really a HBP. All of the venom is directed at Jeter, who acted as if he was struck in the arm by a pitch when replays clearly showed it hit his bat, while almost no one is pointing out another moment of incompetence by an umpiring crew. It's all on Jeter. Derek Jeter is just so evil for doing something each and every quick thinking athlete would have done in the same situation. Heck, even the Rockies Clint Barmes would "cheat" to get an edge for the Rockies. 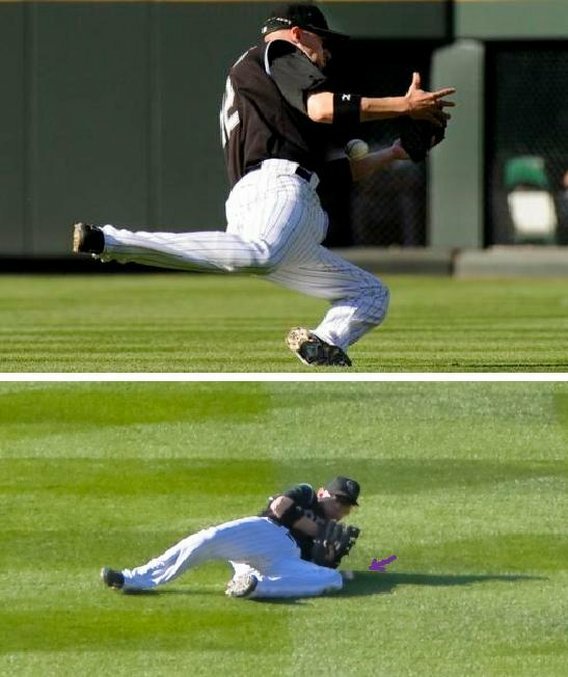 I don't recall any Rockies fans being angry over this play that stole a victory over St. Louis last September. There are four umpires out there. It's on them when these calls are missed. No baseball player is going to make a call easy for them if there's a way to gain an advantage for his team. For people to act like what Jeter was some sinful act that ruins the integrity of the game... it's just stupid. I'm sure the majority of it has to do with Jeter being Jeter, and Jeter being the captain of the Yankees, but seriously, the Rockies aren't above doing the same thing. No team in Major League Baseball is above doing the same. Players don't tell an umpire they were out when they know a call was missed. It's just the way it goes. Play on. And you know what? The Rays did play on. They bounced back and found a way to win the game. That's how you play the damn game.